A trio of the insurance industry’s brightest players in West Yorkshire has been presented with prizes for distinction in the Chartered Institute of Insurance’s (CII) qualifications. 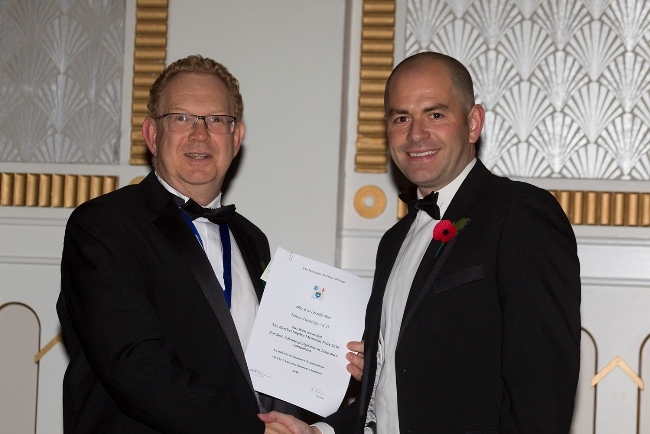 Their achievements were celebrated at the Insurance Institute of Leeds’ (IIL) annual dinner, at the Queen’s Hotel, Leeds, where they received their awards from president, Clive Batchelor. New business broker with Romero Insurance Brokers, Leeds, James Hastings, won the Bartlett Sugden Memorial Prize (ACII); the Trevor Williamson Memorial Prize (Dip CII) went to Katherine Willett, corporate account handler, Proaktive Insurance Brokers, Doncaster; and the Certificate in Insurance Prize (Cert CII), was taken by Stacey Cowan, new business fleet underwriter with Allianz Insurance, Leeds. Sponsored by Independent Appointments, Leeds, the sell-out audience of 416 heard speeches by Mr Batchelor, president elect, David Ross and national CII president, John Moore. Guest speaker was England goalkeeping legend, Peter Shilton. Clive Batchelor said: “ CII qualifications are market leading insurance and financial services study programmes that are respected by professionals and organisations worldwide. Taking top place in the Leeds area is a tremendous achievement and we wish the prize winners the greatest success in their careers. The IIL annual dinner also raised £2,750, to be split between The Insurance Charities – which helps past and present employees in the sector who are suffering financial hardship – and Brake, the road safety charity.